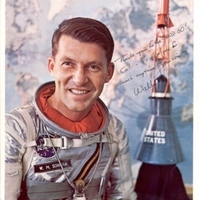 Wally Schirra (1923-2007) was the fifth American astronaut in space and the third to orbit the Earth. 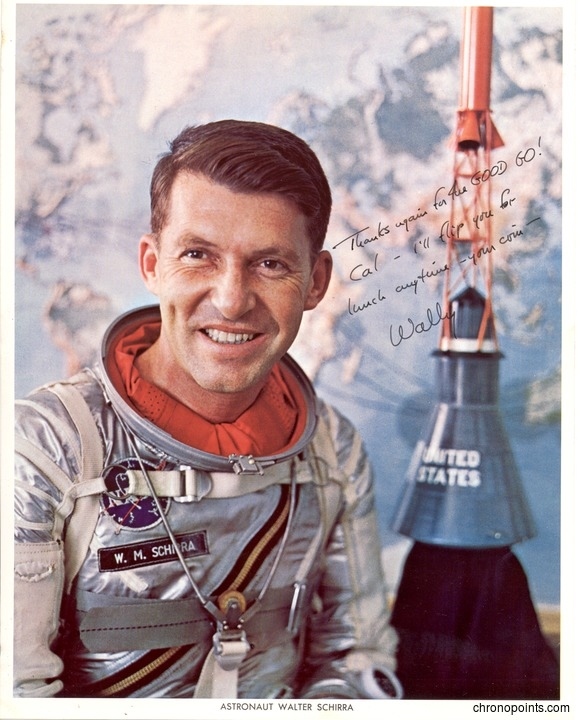 On October 3, 1962, Dr. Calvin D. Fowler, who was the manager and launch conductor for Cape Canaveral Air Force Station Launch Complex 14 (LC-14), confirmed a go for launch with the Project Mercury team in the launch complex's blockhouse and pressed the button to ignite the Mercury-Atlas rocket named Sigma 7. After his successful flight, U.S. Navy Lieutenant Commander Schirra thanked Dr. Fowler for his efforts with a signed photograph. Original 8 x 10 color photographic print: Private Collection of Dr. Calvin D. Fowler. Digital reproduction of original 8 x 10 color photographic print. Thanks again for the GOOD GO! Astronaut Group 1; astronauts; Cal Fowler; Calvin D. Fowler; Cape Canaveral AFS; Cape Canaveral Air Force Station; Launch Complex 14; LC-14; MA-8; Mercury; Mercury 7; Mercury Seven; Mercury-Atlas; Mercury-Atlas 8; NASA; National Aeronautics and Space Administration; Original Seven; outer space; Project Mercury; Sigma 7; space exploration; space programs; Wally Schirra; Walter Marty Schirra, Jr.
“Astronaut Wally Schirra.” RICHES of Central Florida accessed April 20, 2019, https://richesmi.cah.ucf.edu/omeka/items/show/4974.